Comes on limited blue colored vinyl. Funky New Orleans remixes from both sides of the pond! Professor Shorthair (NOLA) and The Allergies (UK) team up to bring you the latest 7inch in the NOLA Breaks series. 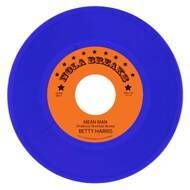 On Volume 5 the soulful sounds of Betty Harris’s “Mean Man” gets an added layer of drums and cuts that’ll be sure to have the dance floor moving. On the flipside, The Allergies remix of “Everybody's Hip Huggin” by Robert Parker is the perfect blend of B-Boy breaks and vintage Funk.